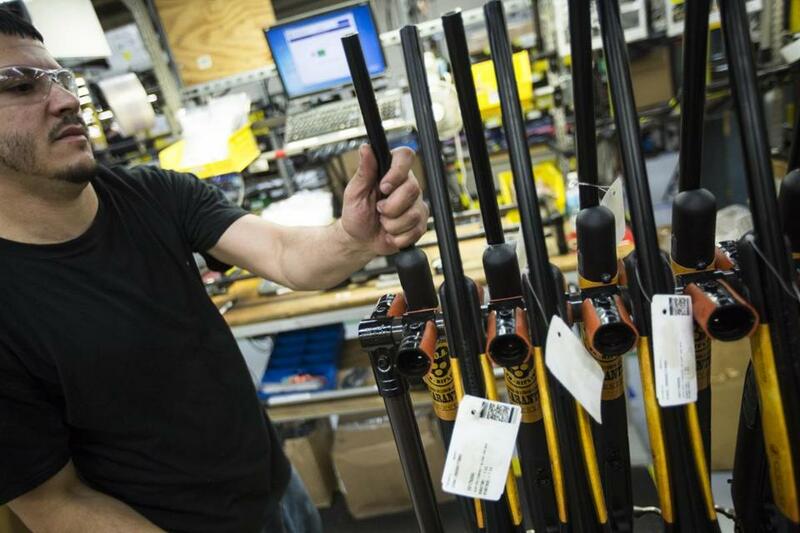 Rifles were stacked before packaging at Smith and Wesson’s Springfield factory. Its stock has more than doubled this year. NEW YORK — Shares of Springfield, Mass.-based Smith & Wesson Holding Corp. jumped to their highest price in eight years, and stock of Sturm Ruger & Co., another gun maker, soared on investor expectations that gun enthusiasts will purchase more pistols and rifles as calls for restrictions increase. The gun makers’ shares have advanced in recent years after mass shootings like the one in California last week that have led to stepped-up efforts to restrict ownership. Sales for both companies have increased as people stockpile weapons in response to politicians’ demands for tougher legislation. The political efforts have all fizzled. Concern for personal safety is also driving demand, Ruttenbur said. The unrest in Ferguson, Mo., and Baltimore led people to purchase firearms — a movement that has been refueled by a fear of domestic terrorist attacks after last week’s shooting that killed 14 and wounded 21 in San Bernardino, California. “It’s kind of a double whammy,” he said. Background checks by the FBI rose 7.7 percent in November from a year earlier, according to Ruttenbur, citing adjusted figures published by the National Shooting Sports Foundation, a trade group. Checks for handguns rose 22 percent, while those for long guns fell 3.8 percent. The FBI checks are the best proxy for gun sales because there are about 200 manufacturers, most of whom are closely held, Ruttenbur said. Spokesmen for Smith & Wesson and Sturm Ruger did not immediately responde to requests for comment on Monday. Smith & Wesson, whose brands include M&P and Thompson/Center Arms, surged 7.6 percent to $20.44 in New York after reaching $20.62, the highest intraday price since October 2007. The shares had doubled this year through Friday. Sturm Ruger, the maker of Ruger American, Gunsite Scout, and Hawkeye weapons, increased 5.8 percent to $57.50 after rising to $58.90, the biggest intraday jump since April 15. The stock had climbed 57 percent this year through Friday. Syed Rizwan Farook and his wife, Tashfeen Malik, who officials say were inspired by Islamic State ideology, opened fire on a office holiday party in San Bernardino on Wednesday, killing 14 and wounding 21.